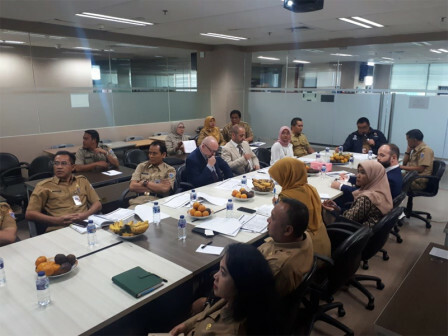 The United Kingdom (UK) Government Digital and Service (GDS) delegations consist of Tim Marcus, Chad Bond, and Warren Smith, held a meeting with members of Jakarta BPPBJ.
" This meeting is to follow up the commitment of anti-corruption summit in London"
Both parties exchanged experiences related to the procurement of goods and services and the potential cooperation that can be done. The UK GDS's Global Digital Marketplace Director, Warren Smith disclosed that the meeting was scheduled to exchange experiences between the British Government and the Jakarta Provincial Government. This meeting was the beginning to explore the potential of the cooperation project that will be run later. "Once identified, we will only design programs that will be run in Indonesia, especially Jakarta for the next three to four years," he expressed, at City Hall, Monday (9/3). He explained that his visit was also to know that the market is diversified and opening up opportunities not only for big entrepreneurs, but also for UKM to get opportunities in government procurement. "This meeting is to follow up the commitment of anti-corruption summit in London," he stated. Jakarta BPPBJ Acting Headm Blessmiyanda added that BPPBJ is currently focusing on procurement modernization to prevent potential corruption. For this reason, there are several programs and strategic steps that will be cooperated with the UK Government regarding the procurement of goods and services. He furthered that they chose Jakarta for consideration as the capital of the country and the budget for the tender included the largest. In addition, Jakarta is deemed to be among the most advanced than other regions in running the marketplace. "Usually the cooperation program is more to training and competency improvement," he said.